If you have these qualities, you may want to consider becoming a ‘citizen scientist’. Citizen scientists around the world are collecting information on birds, butterflies, insects and spiders, the time certain flowers bloom and many other topics. As our climate changes and more questions arise, the efforts of citizen scientists become ever more important. If you have a garden with one or more of our 2013 Garden Pollinator Survey plants (all California natives) we’d like to invite you to participate in our 2013 Mother Nature’s Backyard Garden Pollinator Survey. The garden needn’t be your own – you just need to be able to visit it and make observations. You can even come and survey in Mother Nature's Backyard garden (we're open once a week). Insect surveys are a great activity for young people and we encourage children and their parents to participate. The survey will help us learn which California native flowers attract the most garden pollinators. Data will be compiled and the results posted on Mother Nature’s Backyard blog. The survey will run from June through October, so you have plenty of time to participate. You can do the survey once or as often as you wish (no more than once a week). You can survey a single species (list below) or do all eight if you can. Once you’ve completed your survey(s) you will e-mail your results to us at: mothernaturesbackyard10@gmail.com. Pictures of the plants (as well as the groups of pollinators we are surveying) are available at: http://www.slideshare.net/cvadheim/pollinator-plants-id-sheet. Larger photographs are found at: http://www.slideshare.net/cvadheim/home-garen-survey-flower-pictures-large. You can choose 1, 2 or all eight plants for your survey. The more plants the better; it’s fun and you’ll learn a lot about your garden’s pollinators. If you don’t have any of the 2013 plants – but still want to learn about garden pollinators – use our form and survey methods on several plants you do grow. You might choose a vegetable plant and a flowering plant. Or compare a plant native to your area with a non-native plant. Instructions – The 2013 pollinator survey form is available at: http://www.slideshare.net/cvadheim/2013-pollinator-survey-form-home-22932478 or on the ‘2013 Pollinator Survey - Form’ page (on right of screen). Fill in the date, time, city/state/country in which the garden is located and weather details on the day of the survey. Location and weather can affect your results, so we need that information. Choose one plant per species to survey – all observations will be based on a single plant of the species chosen. Write the name and number of the plant in the recording box before starting the survey. Sit/stand quietly by the plant for 2-5 minutes, or until the pollinators return. Then observe the plant for 1 minute. Make a rough count of the numbers of bees, wasps, butterflies, flies and other insects that visit the flowers during the one minute. You can use the blank spaces on the form to tick off the insects as you see them. We suggest that you begin by recording one pollinator type at a time. Once you’re experienced – or if there aren’t many pollinators – you can record all of them at once. Count up the numbers and record your observations by circling the correct number on the form. 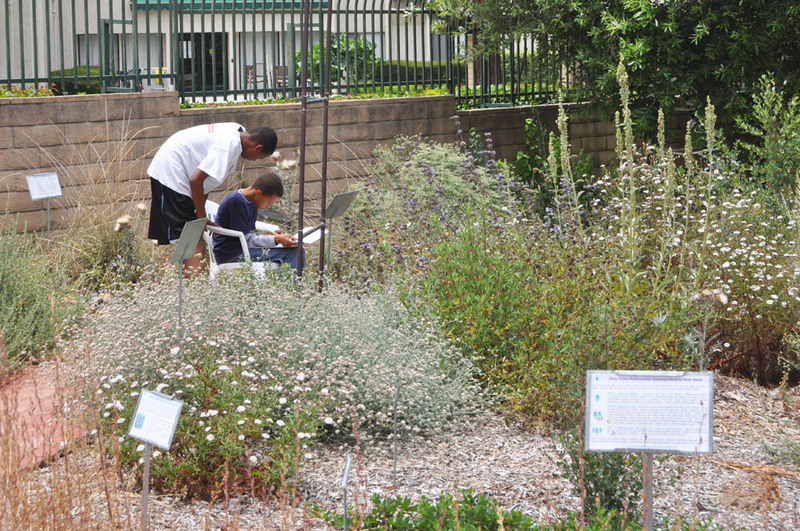 Friends of Gardena Willows Wetland Preserve, Inc.
We hope you participate in the 2013 Mother Nature’s Backyard Garden Pollinator Survey. You’ll be helping scientists understand the pollinators active in California gardens. You’ll likely be surprised at the number of pollinators. You may even note patterns in the time of day or weather conditions associated pollinator activity. Certainly you’ll find the survey process interesting and fun. To learn more about pollinators see our post on ‘Life-friendly Gardening: Planning for Pollinators’ (June 2013).